Arcade Repairs offers quality used arcade games and pinball machines for sale and arcade game and pinball machine repairs. We service new and used arcade games and electronic or electro-mechanical pinball machines in Central Mississippi. We can repair, upgrade, convert and/or restore your arcade games or pinball machines to like new condition. We also build new arcade games into original restored cabinets, and brand new Ms Pacman style cocktail tables with your choice of games. We have used arcade games for sale and pinball machines in stock or we can locate almost any game you desire. Please call Steve at 601-942-9004 or Contact Us for more information. 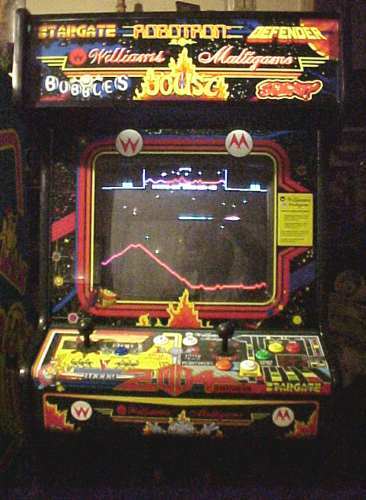 Defender, StarGate, Joust, Robotron 2084, Sinistar, Moon Patrol, Bubbles and Splat! A GREAT ADDITION TO YOUR HOME GAMEROOM! Arcade Repairs strives to provide the best quality service and sales of used arcade games and pinball machines. We warranty our home customer used arcade games and pinball machines that we sell for 45 days! We warranty home customer repairs for 30 days!